Imagine secure, powerful shopping cart software PLUS a full featured gift registry and wish list system connected to your website with just a few lines of simple HTML code! ComboSuite is easily added to your website with just a few HTML links and forms. Drive more traffic to your website! When a customer selects your site to register for their special day or event, they will, in effect, become a marketing representative for your company and products. When they forward their list to friends and family, they are endorsing your website! At just $89 per month, ComboSuite makes adding shopping cart software and a full-featured gift registry and wish list system a breeze! And you won't believe the advanced features and functionality you get for the money. ComboSuite includes features found only in higher-priced commerce software. Start with the Business Intelligence Dashboard. Tracking your web business is taken to the next level with key indicators, flash-based business graphics, drill-down sales reporing, and a library of additional reports. 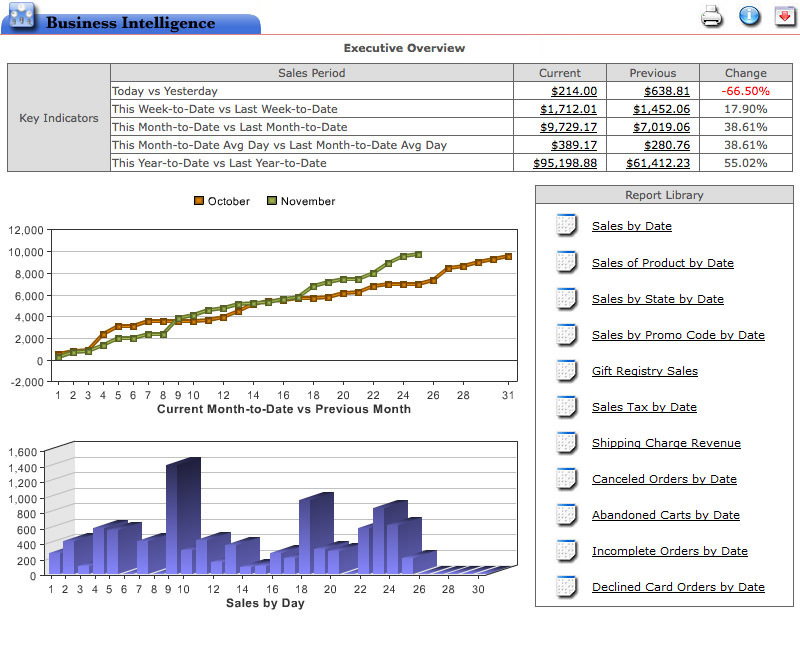 Click for an example of the Business Intelligence Dashboard. A customer shopping on your site wants to know that their personal information is secure. our secure shopping cart software uses industry standard 128-bit SSL encryption security. SSL guarantees security by creating a secure, encrypted channel for data exchange between the user's browser and our ecommerce servers. In addition, we never store credit card data, but pass it only via a secure channel to the credit card processing gateways (Authorize.Net, First Data, Global Payments, Innovative Merchant Solutions, Nova, Paymentech, PayPal Website Payments Standard, Sage Payment Solutions, and more). If you use ComboSuite software, you will never have to worry about your customers' data security. Need an easy-to-setup solution? Simple HTML forms and links are all that is required to add ComboSuite to your web site. The code generator software will automatically create the code that you need to copy and paste into the HTML pages of your site. In addition, if your web site uses a dynamic, database-driven system using a language such as ASP, PHP, ColdFusion, .NET or another web language, we can supply code that you can build in to your pages that will generate the necessary HTML forms. One of the most important aspects of ComboSuite's integration with your business web site is the ability to customize the commerce software to provide a seamless shopping experience for your customers. ComboSuite's customization capability includes custom HTML headers, custom HTML footers, custom background wallpaper, and most importantly, the ability to affect the look of every page using cascading style sheets. These customization features are very easy to setup and our FREE and UNLIMITED technical assistance means that we'll be there to help you customize the system to match your web site. Want to learn more about our advanced feature set? 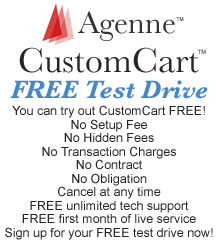 Click to visit CustomCart's feature list. Or maybe you want more information about Registry Valet's advanced feature set. Click to visit the feature list.